Beautiful and substantive, Tokyo Godfathers adds a moving -- and somewhat unconventional -- entry to the animated Christmas canon. In one sense the plot involves returning stolen goods to a thief, but Tokyo Godfathers is really about longing -- for family, for children, for parents and for the lost past. No amount of shoehorned-in razzle-dazzle can keep this forced fable from feeling like a shadow of Kon's early work. Japanese animator Satoshi Kon has a striking sense of composition, but I'm more impressed by his storytelling skills. Takes anime to a whole new level. One of the most moving, enjoyable and wholly unconventional Christmas stories to come along in a long time. Demonstrates an idiosyncratic human touch. Kon is unafraid of the unseemly and unsightly. A film which shows the limitless potential of animation, Tokyo Godfathers is an alternative Christmas classic that's full of unexpected twists, turns and miracles. A festive bonanza which will put plenty of smiles on many faces. With peerless animation, plenty of laughs and just as much heart, Tokyo Godfathers is an absolute joy. It should appear high on your list of alternative Christmas movies. Hana tends to swoon into stereotype, her theatricality and campiness infecting the other non-hetero characters here, with so many of them wailing or sobbing. The story's comedy and pathos can be similarly overwrought, too. A likeably larky Yuletide yarn. Tokyo Godfathers becomes a clever and well-written parody of Christ's nativity. The score grates in places but the script hits the mark, with the potty-mouthed vagrants certain to be a hit with older children. Meh, not really my kind of anime. It was hard for me to keep interest in this story of a baby found by three homeless people during the Christmas holidays in Tokyo, and their search to find her mother. The characters didn't appeal to me, their pasts and how they became homeless didn't endear them to me, and the art style and animation did nothing for me. I guess I just prefer fantasy or sci-fi flavored animation more. To be honest, I probably wouldn't have bothered to finish this if I hadn't told the person who recommended it to me that I'd watch it. Perhaps others will enjoy this more than I did. Tokyo Godfathers makes a genuine effort to tell a heartfelt and touching story, it just wasn't a story that I could bring myself to care about. A "delightful" little Christams story. Beats the hell out of that horrible "It's A Wonderful Life". Saw this movie again and I decided that it deserves a higher rating! The story is a little unconventional for an anime, but that's why I like it so much. It's a perfect combination of humor and drama, and boy is it funny! Hana is definitely my favorite character, it's how he/she talks, walks and looks. And I guarantee you, even if you're not a fan of anime, you're gonna enjoy this and have a good laugh n_n It's beautifully animated, the details, the facial expressions, the colors, the lighting, everything. Love it love it love it!!!! 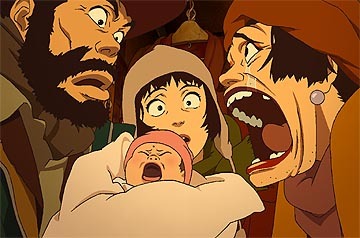 Tokyo Godfathers is a good movie, but it's probably the weakest of Satoshi Kon's films. I don't know if I've outgrown anime, because Paprika elicited a similar underwhelmed reaction, or if I just managed to watch all his best work before the bookend stuff. This for sure has its moments, like the stunning climax (which gets immediately undercut by the lame ending), and Kon has put together a lovable ensemble of characters. But it's a huge tonal mismatch, for one. A Christmas comedy about three vagrants and a dumpster baby...followed by an insane woman trying to kill herself and said baby after kidnapping it from the hospital? Uh, I could imagine this causing some discomfort if you showed it at your next holiday party. This just doesn't hit like the rest of Kon's work does. Anime is a medium that can parlay a lack of focus into tonal strength since it's so visual/multisensory. The more you're getting the better, pretty much. Tokyo Godfathers, unlike Kon's other films, does not have the narrative required to take advantage of this. Simply put: it's done a disservice by being an anime. Worth watching, but if you've already seen Millennium Actress or Perfect Blue, you've gotten the best of Kon.